Design: Philips AC2882 air purifier looks tall and handsome with clean finishes. Unlike other Philips models, AC2882 is built with high grade plastic with round corners and the white color gives an elegant look. The device measuring 35.9 x 24 x 55.8 cm (LxWxH) does look tall, this is justified with an astonishing CADR of 324 m3/h for cigarette smoke and 115 m3/h for formaldehyde, the handle is well blended to the design and makes it easy to carry across your house. Philips AC2882 does not go unnoticeable in any room for its size, however, it really does not take up much footprint or real estate, thanks to its futuristic design. The control panel located on top of the device is neatly laid out and is very easy to read and use, the real time indoor PM 2.5 indicator and the 4-step color ring provides real time feedback of your indoor air quality, both AQI and the light on the control panel can be dimmed and/or turned off avoid light disturbance . However, the black finish of the panel is prone to attract dust and is quite sensitive, even a gentle wipe with a cloth will beep the device. The aerodynamic architecture boosts efficient air flow to clean up a room in less than 30 minutes. Technology: Philips air purifier AC2882 is equipped with Vitashield IPS, with its aerodynamic design and NanoProtect Filter has a boosted clean air delivery rate up to 344 m3/hr*. It can effectively remove ultra-fine particles as small as 20nm, effectively reduce harmful gases such as formaldehyde gas, TVOC and odor. Removes up to 99.9% bacteria and virus. 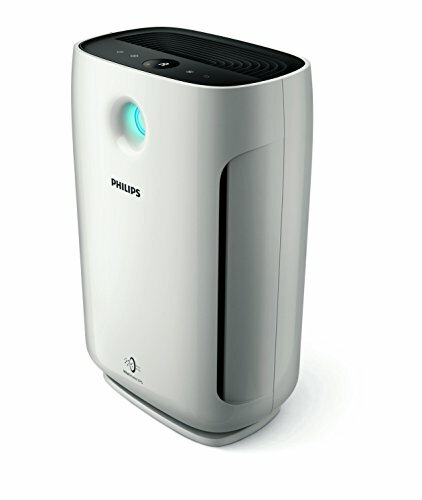 Performance: Hands down, Philips 2000 series of air purifiers are one of the best all-round and affordable air cleaners with the highest Clean Air Delivery Rate (CADR) when compared to other devices in the market, at 200 m3/h, this certainly wins our vote. The device can cover over 400 sq.ft. in air purification, switch on the device in turbo mode and I suggest to close the windows & doors and leave the room for the device to clean up the air in less than an hour. The extra thick Nano Protect HEPA filter helps in super purification of airborne particles which are smaller than 0.02 um. Professional grade AeraSense sensing technology is astonishingly accurate to monitor air quality levels in real time and this sensor also predicts the lifetime of the air filters. The carbon filter assures protection from harmful gases and eliminates bad odor. The night mode is extremely silent and the lights on the device are automatically turned off for better sleep. The silent mode operations is truly un-noticeable with just less than 20 dB(A) and at turbo speed mode, Philips AC2882 has CADR (formaldehyde) up to 115 m3/h and over 334 m3/h for cigarette smoke. Maintenance: Philips recommends periodic cleaning of the air sensors and filters, the device indicates FO on the screen that states the pre-filter needs to be cleaned under tap water, there isn’t a predefined interval as the filter life depends on the air quality. HEPA filters will need to be replaced on the end of its lifetime and the air purifier will stop functioning if the filters are not replaced in 14 days. The composite filters (HEPA + Carbon filter) would cost around Rs. 3595. Air purifier AC2882 is delivered with a 2 year service guarantee for any faulty parts. Philips AC2882 vs AC2887: Well, there isn’t any physical difference between Philips AC2882 and AC2887 as they share the same specs on dimensions and weight. However, the key differences are on the performance and filters, Philips AC2882 has an effective area of 236 to 400 sq.ft, CADR of 115 m3/h and is equipped with a composite filter (integrated HEPA and Carbon filter), whereas Philips AC2887 has an effective area of 258 to 450 sq.ft, CADR of 200 m3/h and is equipped with True Nano HEPA and carbon filters. Other features like timer, light dimmer, Aerasense technology are only available on the Philips AC2887. Conclusion: Hands down, Philips AC2882 is one of the best all-round air purifiers with the highest CADR, excellent features and great technology. The filters have a great life span and they are expensive to be replaced. Philips AC2882 is 100% ozone free, and while the basic air purifiers lack advances filters, AC2882 can filter the minutest of particles, pet dander etc. Philips has hit the sweet spot with aggressive pricing, dependable service and industry leading 24 month warranty. However, I would recommend Philips AC2887 over the AC2882 model for its larger effective area, advanced air filters and higher CADR that makes it more efficient.